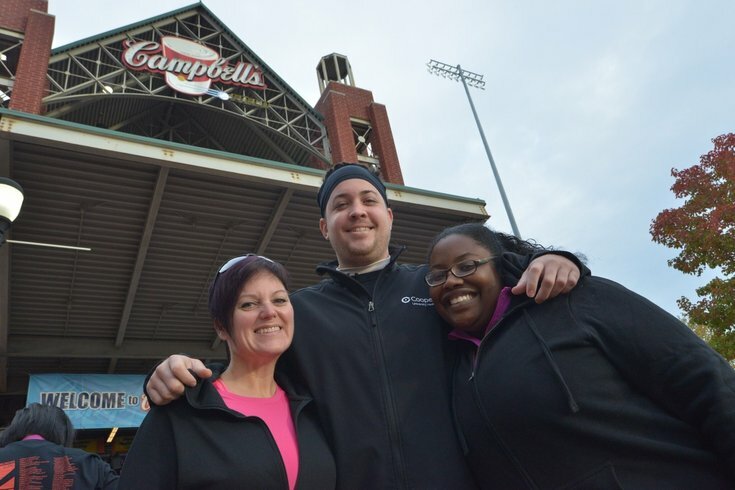 Ahead of the Run the Bridge 10K, Shyra Simone Fullard and Laurie Athey pose with Cooper Bariatric Team dietitian Josh George, outside the gates of Campbell's Field in Camden, NJ. Laurie Athey struggled to ascend a flight of steps without losing her breath as recently as one year ago. But it now takes a lot more for her to become winded – more like 6.2 miles of running. Athey, 45, of Monroeville, New Jersey, and Shyra Simone Fullard, 29, of Williamstown, New Jersey, completed the Cooper Norcross Run the Bridge race on Sunday. It marked the first 10K race finished by the women, who underwent bariatric surgery for weight loss. "My legs felt like jello, but I accomplished something I didn't think I could do," Fullard said. "(At) mile four I said, 'OK, there's only two miles left.' I apparently came up on mile five very quickly — I wasn't aware that I was going so fast. I said, 'I only have 1.2 left,' so at that point I said 'I'm definitely going to finish.'" Fullard spent the last three months training for the race, hoping to finish under 90 minutes. She just missed that goal, crossing the finish line in 1 hour, 41 minutes and 50 seconds. For Athey, who completed the course in 1:16:20, simply finishing was all that mattered. "It went great," Athey said in an email afterward. "Not bad for my first 10K. I couldn't be prouder." The pair was among 3,600 participants who registered for the annual race, which takes runners across the Benjamin Franklin Bridge and throughout the Camden business district and waterfront area. The race raised $400,000 for The Larc School, a special education school in Bellmawr, Camden County. It was sponsored by Cooper University Health Care and the Norcross Foundation. Athey has lost 90 pounds since undergoing a sleeve gastrectomy, a procedure that removes a large portion of the stomach. She had tried "every diet or quick fix that is out there," but her weight always returned. In June 2014, she opted for the gastrectomy to help ensure she will be alive to help care for her parents and family. "I have an enormous amount of energy," Athey said. "I'm healthy. All of my physical ailments that I had prior to surgery are gone, everything from headaches to allergies." Fullard also says she feels healthier, saying tasks that used to be physically difficult now seem like "regular, everyday things." She underwent a vertical sleeve gastrectomy April 22, a decision she made mostly to improve her health. She has lost 50 pounds. Both women took to running shortly after their surgeries. Neither plans to stop, although Fullard might take a winter break. "As soon as the snow melts, I probably will be right back at it," she said. "Running is something I never saw myself doing. Now that I know that I can, I probably won't stop." Fullard was cleared to begin working out eight weeks after her surgery. First, she had to learn the restrictions of her diet, which reduces the amount of food she can eat at any given time. Then she began a training program that includes weightlifting twice a week and a weekend run. "I think my biggest hurdle was probably my first race," Fullard said. "It was The Color Run [in Atlantic City] and it wasn't being timed. There was really nobody to push me. It was just myself out there. I was a little bit nervous that I would become distracted." She made it through by pushing to reach the next color. Entering Sunday's race, she could run 5.5 miles – confidently. "Earlier this year, I didn't think I would ever run a mile, let alone take on six," she said. "When I first started I couldn't even run a quarter of a mile," Athey said. Now, she routinely bicycles, spins and does yoga. She's also in the gym doing weight-training three or four times a week. And she finished her first 10K on Sunday. "I've exercised throughout my lifetime, but never to this extent and to this amount of dedication," Athey said. "I've found that I really like to run."